Fruit flies have a complex enough nervous system, with brains composed of about 100,000 neurons, to support some behaviors found in humans and other mammals. Contrast that with the human brain that has somewhere in the neighborhood of one hundred billion neurons and add the fact that the fruit fly is one of the most studied organisms in genetics and development and you can see why our little insect friend is an excellent candidate for clarifying principles governing how the brain works. A new paper published in Science describes research that uses a combination of sophisticated genetic, anatomical, and physiological techniques to discover a pair of neurons that control a fundamental fly behavior. It seemed the perfect opportunity for me to take a peek at the latest in fly neuroscience. Also, I wanted to see if I could find tools based on Semantic Web technologies that would leverage my knowledge of mammalian brains to help me understand the fly nervous system. As it turns out the paper “Two Pairs of Neurons in the Central Brain Control Drosophila Innate Light Preference” (published October 22, 2010 in Science) is a veritable alphabet soup of fly jargon. “…TeTxLC expression driven by NP394-Gal4 was excluded from the NP394-neurons…” Perfect! The first step described in the paper was to screen a large number of fly larva with a genetic manipulation that, when expressed at a connection between nerve cells, would turn off communication from one neuron to the next (turn off the synaptic release of neurotransmitter). Normally fly larvae avoid light. Most of the genetically manipulated larvae continued to avoid light but some lost any light preference and a few actually preferred light. The team focused on the larvae that preferred light and used labeling techniques to highlight the cells responsible for the switch from light avoiding to light loving fly larvae. They narrowed the cells responsible to two pairs of neurons in the supraesophageal ganglion. At this point I was ready for a quick, preferably visual, orientation to the fly nervous system and how the supraesophageal ganglion fits in. Note: The FlyBase Anatomy (FBbt) ontology is hosted on the Open Biological and Biomedical Ontologies [OBO] website and is available in Web Ontology Language [OWL] in addition to OBO format. Figure 1. 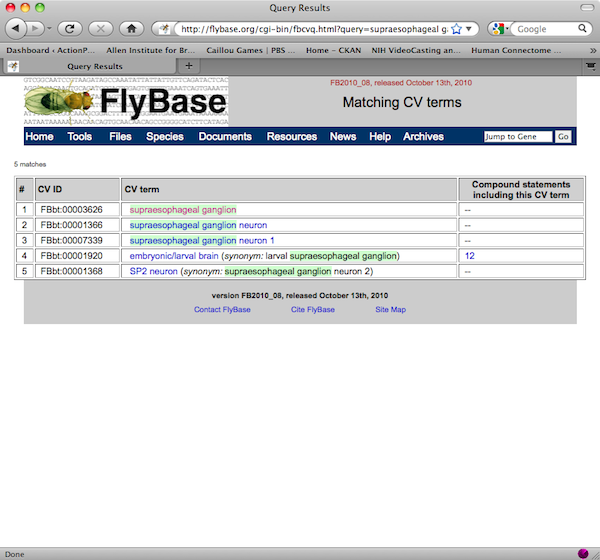 The FlyBase website includes a QuickSearch area. I was able to search for and find the supraesophageal ganglion on the FlyBase website. To try it yourself go to FlyBase and, in the QuickSearch area, open the drop-down menu next to the “Data Class” label by clicking on the up-down arrows. Scroll down and select “controlled vocabularies” and then enter “supraesophageal ganglion” into the “Enter text” box. The page should look something like in Figure 2. Figure 2. Search the FlyBase control vocabularies for supraesophageal ganglion. Note: If you open the drop-down menu for “CV Hierarchy” in the QuickSearch area you’ll see at least 5 ontologies listed. The search for the supraesophageal ganglion will use the FlyBase Anatomy ontology. Click the Search button and you should see a page returned that looks something like in Figure 3. Figure 3. The results from a search for the supraesophageal ganglion. Click on the term “supraesophageal ganglion” and information about the term is displayed like in Figure 4. Figure 4. A description in addition to other information displayed after clicking on supraesophageal ganglion. The page describes the supraesophageal ganglion but this is probably most helpful to a fly specialist. I’ll need to take some time and find diagrams. 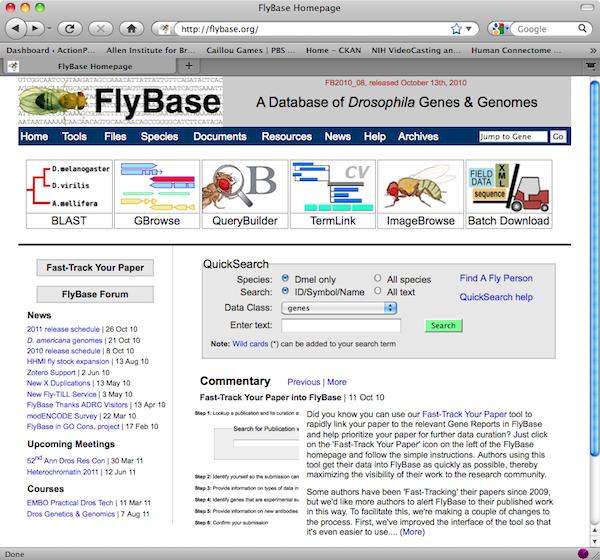 Nevertheless, I’ve found the FlyBase site to be useful even at the anatomical level. 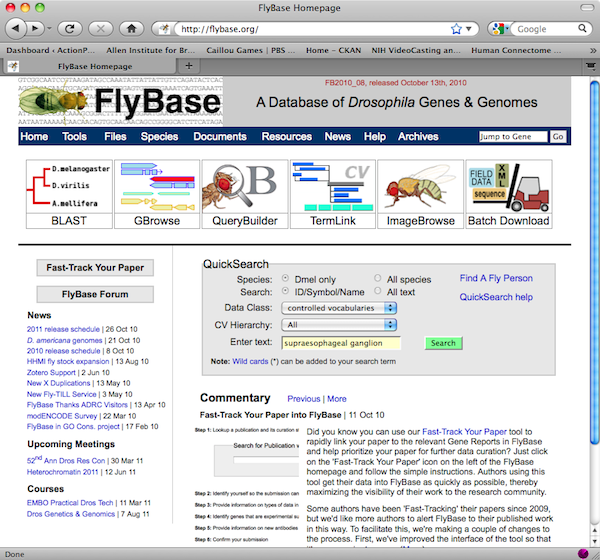 I entered “pdf” into the QuickSearch area and FlyBase returned a list of terms that included “Pdf neuron.” Pdf is a factor associated with specific neurons in the fly larva known to receive input from photoreceptors. The pair of neurons that the research team found (NP394-neurons) are adjacent to Pdf neurons in the supraesophageal ganglion and are involved in light preference behavior. 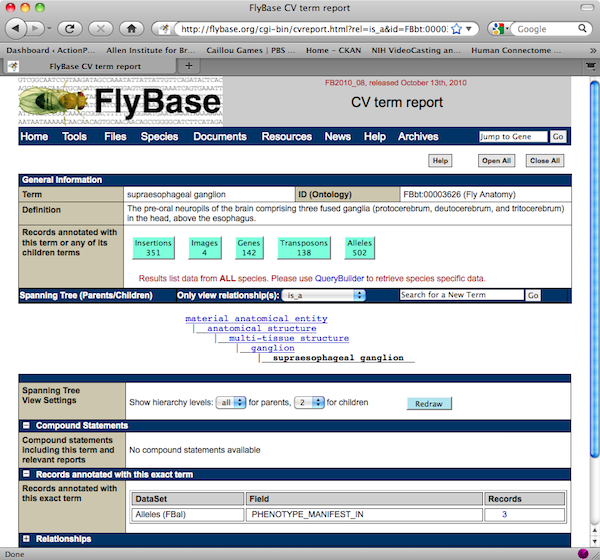 FlyBase doesn’t claim to be an anatomical atlas. It’s a repository for genes and genomes and there are useful links with anatomical terms within this context. However, I’d love to be able to use a virtual fly nervous system similar to the virtual mouse brain in the Whole Brain Catalog. I haven’t found anything like that. Have you? This entry was posted in Brain Science and tagged Brain Science, Open Data Repositories, Semantic Web on November 4, 2010 by Donald Doherty. The queries for neuronal innervation patterns running on the site (try right clicking on the tree) use OWL-DL via a reasoner to query an OWL translation of the Drosophila anatomy ontology. Queries for transgenes and phenotypes use an initial OWL-DL query step to generate a list of ontology term IDs that are then used to query FlyBase. We plan to add additional queries for neurons soon, as well as a bulk download system. BTW – a new OWL translation will soon be available. Among other things, this will standardize URIs, potentially giving better semweb integration. I should add that we intend to open up our system to allow arbitrary DL queries via webservice at some point over the next year.